When it is time to replace your outdoor water faucet, rather from damage or if you simply just want a new look, it is comforting to know that it is a very easy task. There is absolutely no need to call a plumber or even a need to ask a friend instead. In this guide we are showing you How to Replace an Outdoor Water Faucet. All you need to do is go to the store, pick out a new outdoor water spigot, and then bring it home. With the correct tools, a little elbow grease, and a small amount of time you can have the task done in less than twenty minutes. The only concern that remains is having the right equipment to do the job. Once you have your tools and your new faucet, you can go right ahead and begin the job. The last thing you need when you take off the old spigot is water spewing directly into your face and even into your eyes. Take the extra step to locate the water valves on your property and firmly turn them off. Should you need to use a wrench to turn the valve, in the case that it does not have a knob, do not be afraid to do so. Just make sure not to over tighten as it may be difficult for you to undo this later. There is pressure remaining inside the piping and also residual water. To release this pressure, and to drain the excess water, turn on your outdoor water faucet. This will make your job easier and make sure no water sprays out at you when you take the spigot off of the piping. 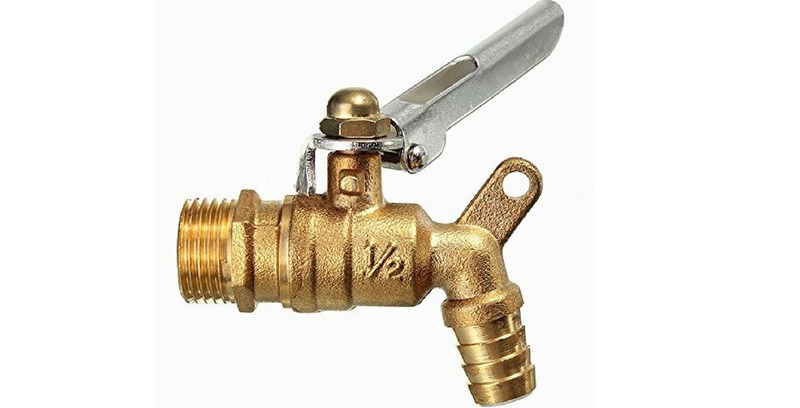 Now that you have properly prepared to remove the spigot, take either your pliers or adjustable wrench and grasp the piping tightly below the outdoor faucet and then use the plumbing wrench to twist the faucet off. This may take some time and strength. If it does not want to come free at first, try using the lubricant on it. In extreme cases, where rust has built up, use something like WD40 to spray the area between the piping and outdoor faucet. Now that the spigot is off, clean the surface of the piping, especially the place where you will install the new faucet. Consider using a copper sponge or a toothbrush to take any bits of rust away from the faucet so your new faucet will be screwed onto a clean surface. Once you have cleaned the surface, wrap Teflon tape around the threads of the piping. The tape will seal the connection and make sure no water leaks out of the tap. Follow the instructions on the package of your new spigot and install it in the place of the new one. After you are sure it is fixed in place, turn your water on and then test the faucet. If it works properly, you are done. Consider taking a picture of your old spigot before you go to the hardware store. This can help an employee locate the appropriate faucet for you. Make sure there is no damage to the piping. If there is, considering replacing it as well. If the spigot is really stuck, considering asking someone stronger to pitch in and help. Taking off an old faucet tap and replacing it is very easy. You shouldn’t get looped into paying someone to do it for you when it is not difficult at all. Just make sure you have the correct tools and then set aside time to do it. You can have a new spigot on in twenty minutes.